Sundays in the DelSo tend to be quiet. Newspapers are delivered, coffee is sipped, spontaneous meals are shared, bottles of wine are uncorked. This past Sunday was no exception to this lovely routine. As a matter of fact, the only exception to the DelSo Sunday rule, was how truly exceptionally well my neighbors and I honored the Sunday tradition with simply perfect food and wine. Like many things, the evening evolved from an offer to share. I had some mussels and some wine, the artists next door had some magical beans that went from being fuzzy and purple to green and tender when cooked. That’s really where we started from. For the mussels, I softened a diced Vidalia onion and a generous amount of minced garlic in some olive oil. After about 10 minutes, I seasoned the vegetables with salt to taste and added 2 chopped tomatoes, a chipotle pepper, about a cup and a half of white wine and two pounds of mussels. I covered the pot and let the mussels pop open. To finish, I tossed in about a third of a cup of basil, (a combination of both Thai and Italian) and warmed up some crusty bread. I can’t believe I didn’t grab a picture of the mussels, but here’s one of the tomatoes I used. 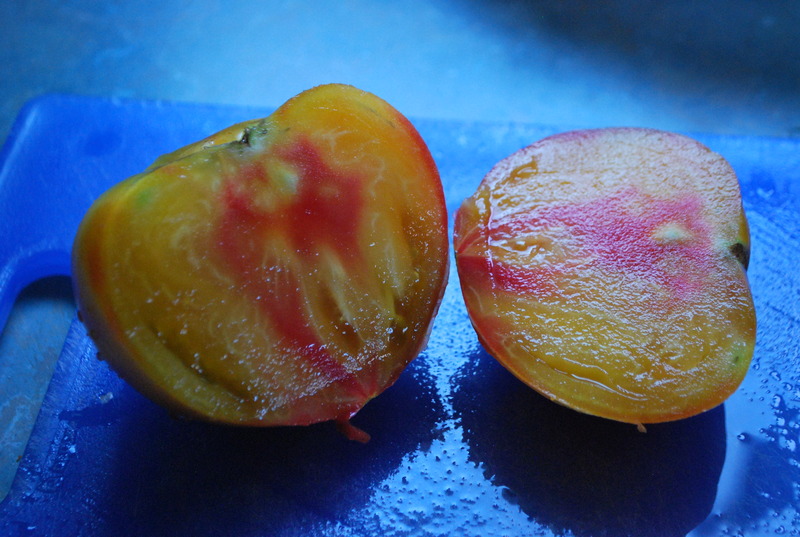 This German striped heirloom was incredibly sweet. Once you see the next series of photos, however, you might get an inkling of how I lost my mind got distracted. Here’s the evening in wine…We opened with a lovely, dry riesling from Alsace which cut right through the fire of the mussel’s chili pepper scented broth. 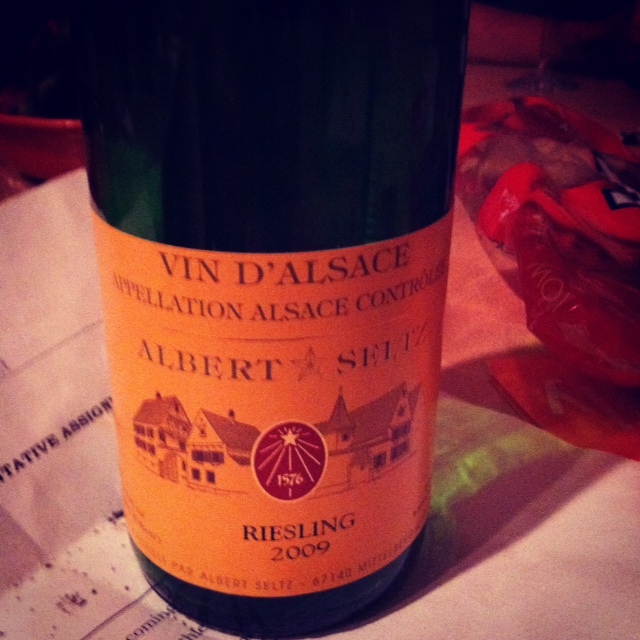 I love Alsatian wines and was very happy to share this souvenir from the neighbor’s recent trip abroad. C’est bon! 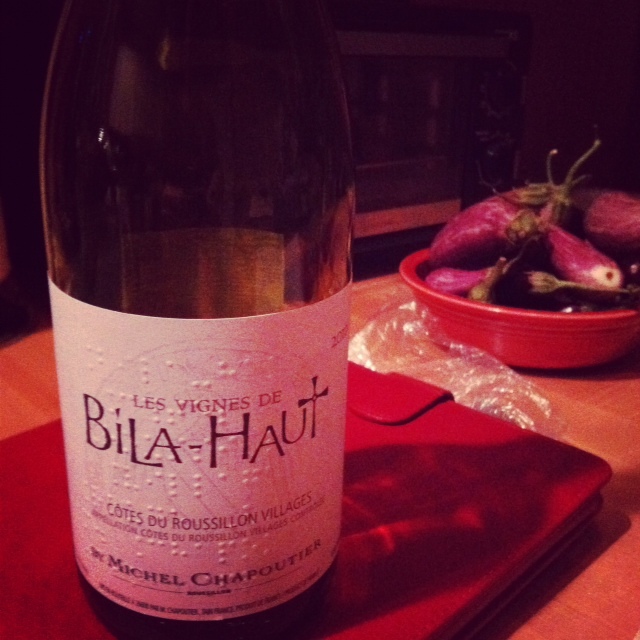 Our next stop was Domaine Bila Haut Cote du Roussillon, 2010. I think I must have picked this up from Empire. I believe it was really inexpensive and I know I am happy to have another bottle of this still around. 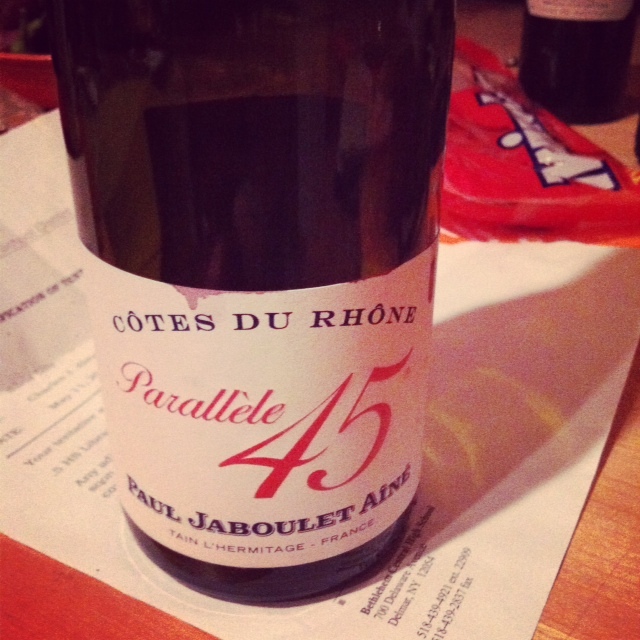 Next up was this Cote du Rhone. This was another bargain that Ken probably picked up at Capital and it was nicely balanced and managed to be smooth, yet a little peppery. Tasty. At this point we probably could have stopped, but, it was barely 9:00 and we wanted one last bottle so I closed my eyes and reached into the wine rack. Let me tell you something – they say you should open with your best bottle and work your way down in quality as your taste buds become desensitized. That was not our method at all! 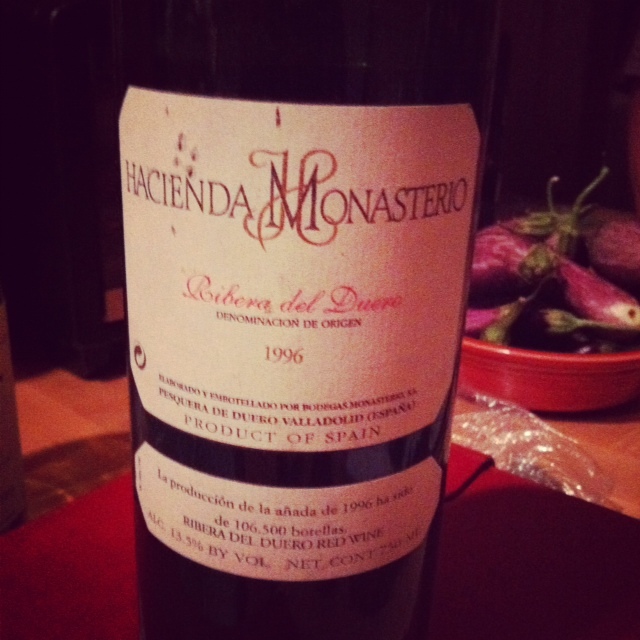 The final bottle was transcendent. It was meaty and mushroomy and velvety and absolutely delicious. I read some of these notes and, honestly, I don’t know what they were drinking but it wasn’t the same experience we had with this bottle At all. It was a very fine bottle of wine and I couldn’t have been happier than to have shared it with my awesome neighbors on a summer Sunday. Check out this cool All Over Albany post!